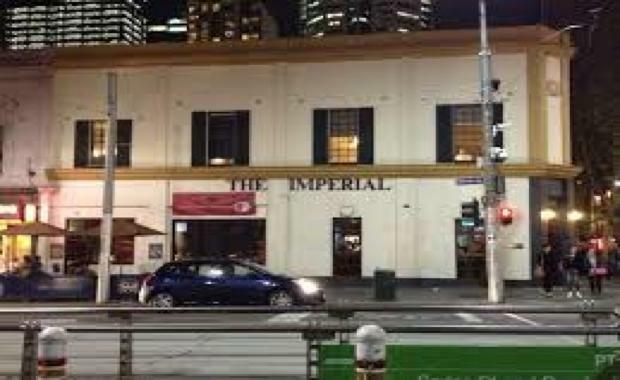 The Imperial Hotel - one of Melbourne's oldest pubs - has been sold at auction for $11.45 million. More than 200 people attended the auction of the pub, which was established in 1858 and is located directly opposite Parliament House on the corner of Bourke and Spring Streets. The owners, property developer Mark Robertson and his father-in-law retired estate agent Alexander Robertson, achieved a yield of 3.6 per cent on the sale. A private local family purchased the property. The two-storey building, which is situated on a 450sqm site, was sold through Josh Rutman, Mark Wizel and Scott Callow of CBRE and Steve Cropley of Cropley Commercial. The Imperial Hotel includes bistros, function room and upper floor offices and storerooms.